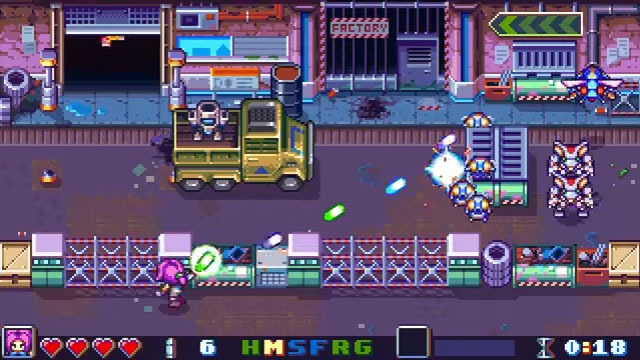 Bot Vice, from DYA Games, developers of Super Star Path, is a pixellated gallery shooter inspired by the likes of Wild Guns. The game stars 28-year-old ex-cop Erin Saver, who recently lost her partner and her right arm to a group of criminal cyborgs known as the Wildbots. Now, the Wildbots have returned and are threatening to destroy the Tominaka Plaza building, and Erin decides to go after them herself, exacting revenge with the help of her new bionic arm. Unfortunately, she only has 45 minutes to do so, which is a real time limit placed on the player... there are 24 levels in the game, and future levels remain locked if the player doesn't get through the preceding ones quickly enough. Fortunately, players can retry previous stages to go for better clear times and unlock new levels. Erin can lock onto enemies, destroy explosive barrels, dodge to avoid incoming projectiles, and cycle through an array of weaponry as the situation demands, allowing skilled players to swipe through swaths of robotic baddies. The game is coming to PC, Mac, and Linux via Steam on July 11.